On this page you will learn how to create a Dragon1 Architecture Diagram, it is an example of a formal architecture diagram. The subject of the diagram is to show an architecture solution and has the title 'The Digital Future of the City Of Atlantis'. Besides Dragon1 is a software platform, it is also an open EA Method that defines what is enterprise architecture and what is on an architecture diagram. According to Dragon1, Enterprise Architecture is the total concept for an enterprise structure, consisting of a coherent set of constructive, operative and decorative concepts. Enterprise Architecture bridges the gap between Enterprise Strategy and Enterprise Transformation. Enterprise Transformation can be seen as the total set of programs and projects in an organization. Solution Architecture is like a total concept or conceptual solution for a part of the strategy. That solution architecture can be drawn on an architecture diagram. 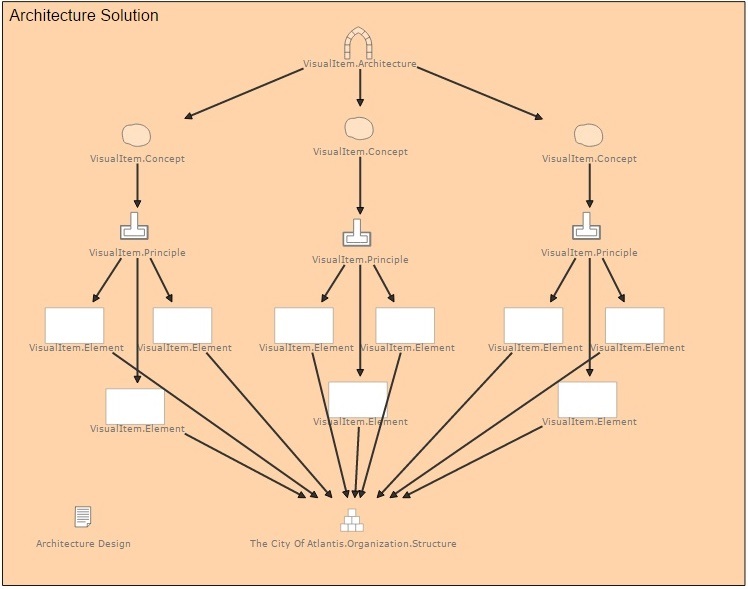 The conceptual diagram we are creating here is a solution architecture. It shows the total concept for a part of the strategy. A total concept consists out of concepts. So concepts must be on an architecture diagram. Concepts have a way of working delivering results and consist of elements (logical functional parts), so these also must be on an architecture diagram. Screenshot two shows such a pattern for an architecture diagram. 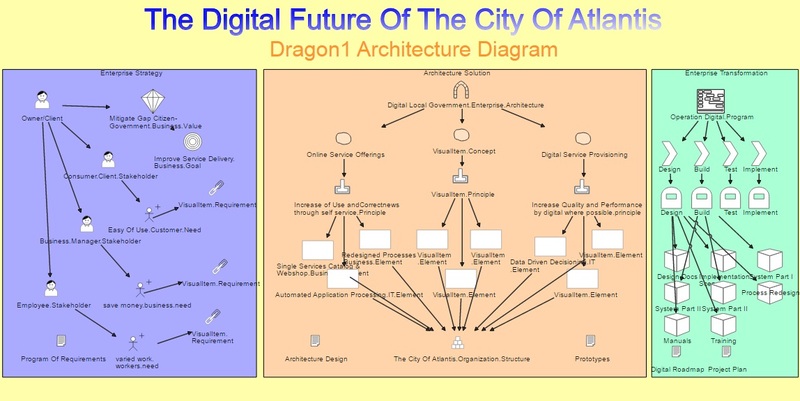 You can of course only draw the architecture on an architecture diagram, but in Dragon1 we prefer to provide context to an architecture so stakeholders (decision makers) know better what decisions to take because they can look at the whole picture. Also in projects, people better know what to do, how, why and when because of the context of the architecture diagram. For a brief overview of defined core terms of Dragon1 open EA Method read here: Dragon1 Architecture Modeling Glossary. A Dragon1 architecture consists of three parts, and you may choose to show one, two or three of these parts. So by creating and drawing at minimum these entities of these three parts on a canvas you are creating a Dragon1 compliant Architecture Diagram. NOTE: This is a case example! The city of Atlantis has been confronted with citizens not making use of the services of the municipality. This because of many reasons. Also, the employees report that they are more and more unhappy with their workplace. It is outdated, the management structure is from the 80s, no youngster is anxious to come work at the organization. So the management of the organization really needs to change things drastically in order for the organization to reach its goals and to produce results. In order to cope with the problems, the management (the owner/client for the architect in this case) of the organization has chosen for a Digitization Strategy: What can be done digital MUST be done digitally, in order to speed things up and make it all more modern: To be ready for the future. The business value for the organization of the Digitization Strategy is that it mitigates the GAP between citizens and government, it increases processing data and speeds for delivering services. This business value has been converted into a goal: Improve Digital Service Delivery. To get the correct needs with this strategy and goal the following stakeholders have been interviewed: Citizens, Employees and Managers. Their respective needs for a digital gov-services solution are: Ease of Use, Varied Work and Saving Costs. Every need has to been turned into at least one requirement. This is not done yet. Something you can do to make this tutorial your unique diagram. At the municipality of Atlantis they have a young but experienced creative architect working. Sarah has always dreamed of turning the organization into an example of sustainability. Now she got the chance to use a sustainability concept in the enterprise architecture and solution architecture for her employer. The owner/client at the organization always needed to smile when he saw her inspirational architecture concept presentations and now he gives her the assignment to design an architecture fitting the strategy. To start with she comes up with a catchy name for the architecture 'Let's Get Digital' which she will use in a presentation, but in the conceptual diagram, she uses the more descriptive name ' Digital Local Government Architecture'. For every need and requirement, she starts by selecting one concept that fulfills it / does the job. She selects the following concepts: Online Service Offerings, Artificial Intelligence (such as Cognitive Information Layout) and Digital Service Provisioning. She selects these concepts because she has seen them work at other organizations and she has read some background literature on it, which she will reference in the design. These three concepts together form a total concept and therefore an architecture. We will now look into the principles of the concept to know what the elements are that needs to work together in order to create a certain result. These elements have to be implemented so that in fact the concept is implemented. NOTE: You always have to adopt a concept, its elements and principles to your organization context to make sure it works the way you want it. So you can't just copy what is in the textbook about a concept. Creating Ease of Use by Artificial Intelligence (such as Cognitive Information and Deep Learning) - By only showing the minimum information needed for input and output in a web application and hinting what to do now and next, proactively correcting and hinting what to do, the users (citizens and employees) will do more in less time, have more fun in using it and experiencing the application as easy to use. Increase quality and performance by Digital Provisioning - Digital Provision ensures that you make fewer mistakes in communication towards users (citizens and employees): you prevent inconsistencies by not being able to send out different versions. You are more sustainable by not printing things on paper. You are quicker in communication and delivery because you do not have to wait for things to be printed, packed and shipped. In the example diagram you will see we have drawn three concept shapes. Try to choose your own concepts for your own needs and requirements on your diagram. And try to write down the principles of all these concepts based on literature research (and reference it). Next, you draw the elements (at logical level), or components at physical level of the concepts and principles. In the formulation of the principles every noun used is an element and or a component. So use these words to draw your elements or component. Note: An element (at logical level) may be converted into one or more components at physical level. Examples of elements are 'sales process', 'communication device'. Examples of components (derived from the elements) are 'online point of sale (POS)' and 'a smartphone'. Now remember concepts, elements and components are all relative to each other. What is a component in one diagram, is a concept in another diagram, by a different definition or different viewpoint. With the elements in this diagram you see a structure. The structure can also be a system or solution. In this case the enterprise structure is the municipality of Atlantis. On this structure the concepts and principles will be applied and elements will be implemented. Sarah also creates a document called Architecture Design and there she writes down and visualizes with pictures everything she wants to tell to all the stakeholders about these concepts, principles, elements and components. She creates 2,5d prototype visualizations (2d visualization using 3d shapes) and time-lapse visualizations, all showing artist impressions of the concepts in place in the organization. These prototypes give everyone, management and employees AND citizens a very good idea of the new situation and impact on the current situation. This will increase support for her target architecture. As enterprise architect you are not only the moderator of creating a Program of Requirements and designer of a Total Concept, but you are also the supervisor of the realization of the total concept in the enterprise structure. So, therefore, we need to model the enterprise transformation as it follows from the architecture (the total concept). Sarah calls the program of change 'Operation Digital', containing several projects that will implement her architecture. She defines four stages (or phases) in her project: Design, Build, Test and Implement. Every stage needs to be rounded off with a milestone in the form of a document. Per phase, she has defined the most important deliverables like: training, redesigned processes, implementation scenario, etc... Finally, she creates a digital roadmap detailing the planning as far as she knows it and she supports the program manager and project managers in creating the project plan. This case description can be turned into a diagram like the one below. Just follow the next steps and see how you can create a slightly adapted diagram for your own situation. Of course, in practice, the diagram contains more shapes than this example. Just for starters try to keep the number of shapes you use on this Dragon1 Architecture Diagram below 100 and create it on A) size. If you print it out or presents it on A0 size, it will be much better to read. Insert a visualization. Give the visualization a name. Link the shapes together as if they were three separate models. Publish the visualization by clicking on Share. Select published publicly. Go to the Content Viewer. Select your diagram and view it in the player. Mail the link of the visualization to the stakeholders and ask them to comment on their findings on the visualization. Process the comments to improve the visualization and send it back to them. Enable the list of updates and changes in the visualization so the stakeholders can see what you have done with their comments. Screenshot of the architecture diagram. Screenshot of the complete diagram.